PAPER INSURANCE DISCS displayed on car windscreens could be no more, if government adopts an Oireachtas committee’s key recommendations. Over the last number of months, the Joint Committee on Finance, Public Expenditure and Reform has been listening to submissions about the rising cost of car insurance. Yesterday, committee chairperson Fianna Fáil’s John McGuinness said consumers had been “thrown to the wolves” by the insurance industry with some drivers seeing a 300% price hike in their premiums. 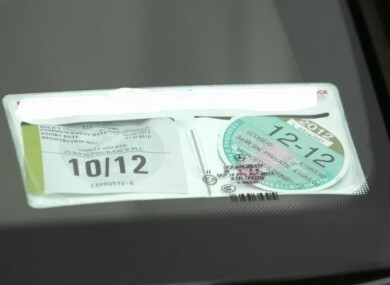 One of the recommendations contained in the report is to replace paper insurance discs with Automatic Number Plate Recognition (ANPR) technology. ANPR technology would allow gardaí identify the owner of the vehicle by scanning reg plates, without the need to check windscreen-mounted insurance discs. It’s recommended this is done “as a matter of urgency” and that gardaí be given the additional supports, resources and training they need to bring the system online. McGuinness told TheJournal.ie there had been no costing of the measure, but said it was necessary in order to bring Ireland “up to speed” with other jurisdictions around the world. Fianna Fáil Senator Gerry Horkan said that “instead of gardaí at 11 o’clock at night flashing lights and pulling people over at the side of the roads” to check insurance discs, the ANPR technology would be a better use of garda resources. He said many other countries are leading the way with improved practices and better technology, adding: “There is no reason why we can’t follow other countries who are leaders in this”. The committee also called for further investment in technology by the insurance industry to lower the cost of car insurance. It said it would like to see telematics recordings used more. This allows the insurer to track the driving patterns of a driver. It’s believed the information could be used by consumers to get a reduced premium. The report called for the Central Statistics Office (CSO) to immediately be assigned responsibility for collecting information on claims data and said an integrated data hub should be established as a matter of urgency to facilitate data sharing between the National Car Test (NCT), insurance, tax agencies and the gardaí. Yesterday, McGuinness was critical of Insurance Ireland – an organisation that represents insurance companies. He criticised the organisation for not furnishing further information that was requested by members after their appearance before the committee. McGuinness said it was not acceptable for the organisation to state facts and figures during the committee hearing and not supply the backup information to TDs. “No, they have not come back yet,” said McGuinness when asked if the information had been forthcoming. “It is this type of engagement that needs to change,” he stated, adding that if information is requested by Oireachtas members it should be supplied. In a statement, Insurance Ireland welcomed the publication of the report, stating that for the past 18 months it has repeatedly called for action to be taken to address the spiralling cost of claims which it claims has led to increases in motor premiums. Kevin Thompson, chief executive of Insurance Ireland said it has provided approximately 50 responses to the Department of Finance and will continue to engage fully in this process. “Insurance Ireland is committed to, and is actively working on, transparency initiatives and data submissions to inform policy responses to the rising cost of claims,” he added. We share our customers’ frustrations at the increase in motor premiums and recognise the public concern that exists on the issue. Insurance Ireland want to work collaboratively with government to take the necessary actions to bring stability to the sector. McGuinness also called on the Central Bank to take a greater role and do more to protect consumers. Email “Your paper insurance disc could soon be a thing of the past”. Feedback on “Your paper insurance disc could soon be a thing of the past”.